Picture - A captured Morane-Saulnier Type L with German insignia. Some believe it to have been a German Pfalz A.I, which was an unarmed license-built Type L, but it is missing the distinctive features of the A.I. The Morane-Saulnier L, also known as the Morane-Saulnier Type L was a French parasol wing one or two-seat aeroplane of the First World War. The Type L became one of the first successful fighter aircraft when it was fitted with a single machine gun that fired through the arc of the propeller, which was protected by armoured deflector wedges. Its immediate effectiveness in this role launched an arms race in fighter development, and the Type L was swiftly rendered obsolete. The original Type L used wing warping for lateral control, but a later version designated Type LA was fitted with ailerons. Built by Morane-Saulnier, large numbers of the Type L were ordered by the French Aviation Militaire at the outbreak of the war, being designated the MS.3. In total about 600 Type Ls were built and, in addition to the French air force, they served with the Royal Flying Corps, Royal Naval Air Service and the Imperial Russian Air Service. The type was also produced under licence in Germany by Pfalz Flugzeugwerke as the unarmed A.I and A.II scouts, and later the E.III armed scout. A few Type Ls captured by Germany were fitted with a single German Spandau IMG 08 machine gun. These captured and converted aircraft are often mistaken for Pfalz E.IIIs. In December 1914, renowned French aviator Roland Garros, then serving with Escadrille 23, worked with Raymond Saulnier to mount a machine gun on his Type L. Saulnier had experimented with a mechanical interrupter gear but reverted to the simpler solution of using armoured propeller blades. Garros' mechanic further improved the system by fitting deflector wedges to the blades in line with the barrel of the gun. Garros took his Type L fighter into combat in March 1915 and achieved immediate success, shooting down three German aircraft in April, a noteworthy feat at the time. On 18 April 1915, Garros' Type L was forced down behind German lines and was captured before Garros could burn it. This motivated the Germans to develop their own fighter, which materialised at the end of May as the Fokker E.I, fitted with a true synchronizer system. 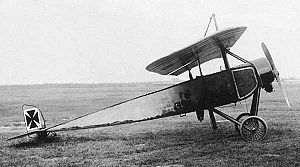 Ironically, one of the two seat Morane Type Ls, of Escadrille M.S.48, was the victim of the first true fighter victory on July 1, 1915, when Leutnant Kurt Wintgens, while flying his Fokker M.5K/MG pre-production Fokker Eindecker prototype aircraft no. E.5/15, fitted out with a very early example of the Fokker Stangensteuerung gun synchronizer system, downed one over Luneville. About 50 Type Ls were delivered to Britain's Royal Flying Corps, which used them as reconnaissance aircraft during 1915, with a further 25 being operated by the Royal Naval Air Service. On 7 June 1915 one of these aircraft, flown by Flight Sub-Lieutenant Reginald Alexander John Warneford of 1 Squadron RNAS intercepted Zeppelin LZ.37, destroying it, the first Zeppelin to be destroyed in the air. Warneford received the Victoria Cross for this achievement. Bruce, J.M. The Aeroplanes of the Royal Flying Corps (Military Wing). London:Putnam, 1982. ISBN 0 370 30084 x. Green, William and Swanborough, Gordon. The Complete Book of Fighters. New York: Smithmark, 1994. ISBN 0-8317-3939-8. Morane-Saulnier L Pictures and Morane-Saulnier L for Sale.